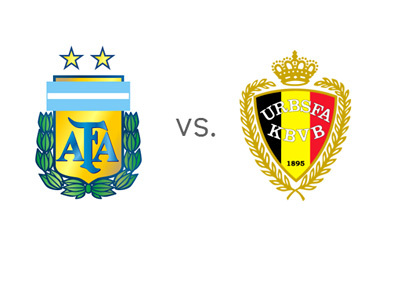 Argentina and Belgium meet in the World Cup quarter-finals on July 5th, 2014 at Estadio Nacional in Brasilia. Argentina earned their spot in the last eight by topping Group F with wins over Bosnia & Herzegovina (2-1) Iran (1-0) and Nigeria (3-2), before dispatching Switzerland (1-0) in a thrilling Round of 16 match, which went to extra time. The team's captain and the world's best footballer, Lionel Messi, has lived up to his reputation so far in the tournament and is the reason why Argentina are one of the favorites to go all the way this year. Belgium, with their star studded lineup, are the tournament's dark horse. The Red Devils topped Group H with victories over Algeria (2-1), Russia (1-0) and Korea (1-0), before eliminating USA (2-1) in extra time of what was one of the most exciting matches of the World Cup so far. The team's best player, Eden Hazard, has had a fairly quiet time in Brazil so far and will need to step up his game if Belgium are to get past Argentina and reach the semi-finals. Argentina are the favorites to win according to the odds. Sergio Aguero is doubtful to start for the South American side due to a muscle injury, but with the likes of Messi, Higuain, Di Maria and Lavezzi up front, Argentina still have one of the most potent attacking forces in the tournament. The Belgian side are injury and suspension free. Romelu Lukaku is likely to start up front, after he won the game for his nation vs. USA, with his dominant off-the-bench performance in extra time. Thibaut Courtois, the man between the sticks for Belgium and one of the best young goalkeepers in the world, is very familiar with Lionel Messi and his game, having faced him 5-6 times this past season alone in the Spanish La Liga and the UEFA Champions League. The upcoming match between Argentina and Belgium has the potential of being a classic. South America vs. Europe. Eden Hazard vs. Lionel Messi. Hold on to your seats, it could be a good one!